Eligiblity Criteria :- BE/B.Tech in Mechanical, Electrical, Civil, Electronics, Chemical or Biotechnology or M.Sc in Physics, Chemistry, Materials Science, Nanoscience or Photonics with Mathematics at B.Sc level least 55% marks in the qualifying examinations. The equivalence of degree can be worked out as per the eligibility criteria specified by Association of Indian Universities (AIU). Number of Scholarship There are 8 Fellowships available to SAARC students equally distributed including India (a maximum of two students from a SAARC country may be engaged depending upon the vacancy exists). Selection Criteria: Country vise preliminary selection and nomination will be executed by the local SAF chapters based on the eligibility criteria by providing equal opportunity. 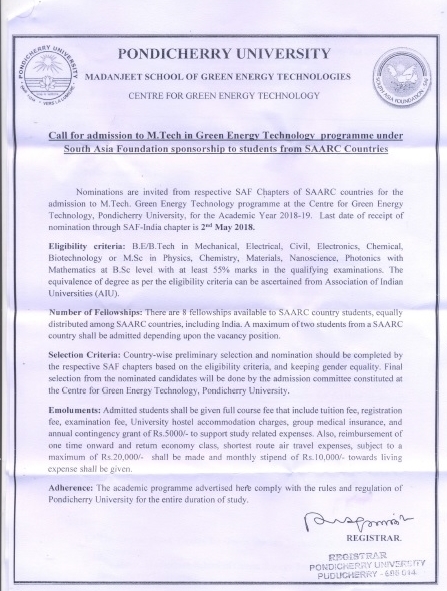 Final selection from the nominations will be done through the admission committee constituted at the Centre for Green Energy Technology, Pondicherry University, Puducherry, India as per the Association of Indian University norms for eligibility. Emoluments : Monthly stipend of Rs. 10,000/- plus admission fee as per Pondicherry University regulations (i.e. Registration and tuition fee etc. for 2 years) plus Hostel accommodation charges plus student group medical insurance plus re-reimbursement of to and fro AIR fare for the shortest route (subjects to a maximum of Rs. 20,000/travel) plus an annual contingency grant of Rs. 5000/ per year to support for the purchase of study materials. 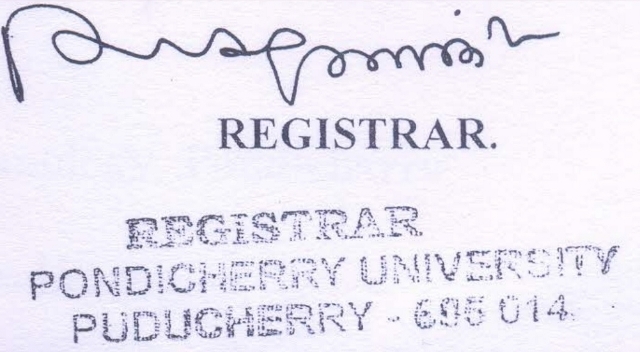 Adherence: Pondicherry University regulations will apply for the entire academic program advertised here.